BP agreed to pay the largest criminal fine ever brought against a single corporation; the U.S. government in turn agrees not to press more charges against the oil company responsible for the 2006 oil spill. NBC's Pete Williams reports. Updated at 2:45 p.m. ET: BP will pay approximately $4.5 billion and plead guilty to manslaughter and other criminal charges as part of a settlement with the U.S. government over the deadly Deepwater Horizon rig explosion and massive oil spill in the Gulf of Mexico in 2010, the London-based oil giant and federal officials said Thursday. The settlement total, to be paid out over five years, includes more than $1.25 billion in criminal fines -- the largest such penalty ever. In addition, two BP employees have been indicted on manslaughter charges and a BP executive has been indicted on charges he lied to authorities about his work estimating the Gulf spill rate. At an afternoon news conference in New Orleans, U.S. Attorney General Eric Holder called the wide-ranging settlement "the latest step forward in our ongoing efforts to achieve justice for those whose lives and whose livelihoods were impacted by the largest environmental disaster in the history of the United States." He said the settlement amounts mark "both the largest single criminal fine … and the largest total criminal resolution" in U.S. history. BP has agreed to plead guilty to 11 counts of felony manslaughter, one count of felony obstruction of Congress and violations of the Clean Water and Migratory Bird Treaty Acts, Holder said. The agreement, subject to court approval, resolves all federal criminal charges and all claims by the Securities and Exchange Commission against the company stemming from the explosion and leak, the largest accidental marine oil spill in history. “All of us at BP deeply regret the tragic loss of life caused by the Deepwater Horizon accident as well as the impact of the spill on the Gulf coast region,” Bob Dudley, BP’s group chief executive, said in a statement announcing the settlement. 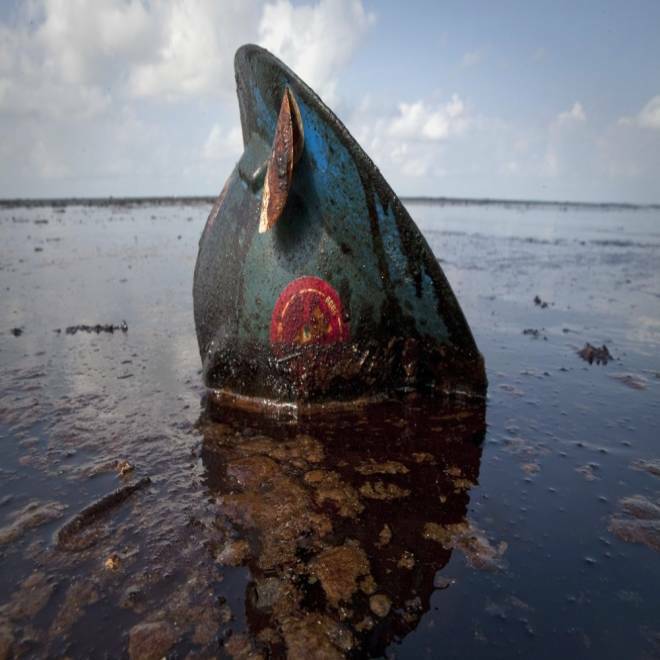 A hard hat from an oil worker lies in oil from the Deepwater Horizon oil spill on East Grand Terre Island, Louisiana in this June 8, 2010 photo. In addition, a federal indictment unsealed Thursday charges David Rainey, who was BP's vice president of exploration for the Gulf of Mexico, with obstruction of Congress and making false statements. He is accused of lying to federal investigators when they asked him how he calculated a flow rate estimate for BP's blown-out well in the days after the disaster. Two BP well site leaders, Robert Kaluza and Donald Vidrine, were indicted on manslaughter and involuntary charges, accused of disregarding abnormal high-pressure readings that should have glaring indications of trouble just before the deadly blowout. Rainey's lawyer said his client did "absolutely nothing wrong." And attorneys for the two rig workers accused the Justice Department of making scapegoats out of them. "Bob was not an executive or high-level BP official. He was a dedicated rig worker who mourns his fallen co-workers every day," Kaluza attorneys Shaun Clarke and David Gerger said in a statement, The Associated Press reported. "No one should take any satisfaction in this indictment of an innocent man. This is not justice." Before Thursday, the only person charged in the disaster was a former BP engineer who was arrested in April on obstruction of justice charges, according to AP. He was accused of deleting text messages about the company's response to the spill. The Deepwater Horizon rig, 50 miles off the Louisiana coast, sank after the fiery explosion. The well on the sea floor spewed an estimated 206 million gallons of crude oil, soiling sensitive tidal estuaries and beaches, killing wildlife and shutting vast areas of the Gulf to commercial fishing. On the docks in Louisiana, fishermen and oystermen say the effects of the BP oil spill remain today. NBC's Anne Thompson has more. After several attempts failed, engineers finally managed to cap the gushing well on July 15, 2010, halting the flow of oil into the Gulf after more than 85 days. Thirteen of the 14 criminal charges to which BP plans to plead guilty pertain to the accident itself and stem from the negligent misinterpretation of a negative pressure test conducted on board the Deepwater Horizon, BP said. The company said it acknowledged this misinterpretation more than two years ago when it released its internal investigation report. The remaining criminal count of obstruction pertains to allegations that company officials lied to Congress about how much oil was pouring out of the ruptured well during the spill response. As part of its resolution of criminal claims with the U.S. government, BP will pay $4 billion in installments over five years and has also agreed to five years’ probation. The amount includes about $1.25 billion in criminal fines, nearly $2.4 billion to be paid to the National Fish & Wildlife Foundation and $350 million to be paid to the National Academy of Sciences. BP said it will also pay the SEC $525 million over three years to settle all securities claims. The $1.25 criminal penalty is the largest in U.S. history, eclipsing the nearly $1.2 billion paid by Pfizer Inc. for marketing fraud related to its Bextra pain medicine in 2009, according to Bloomberg and AP. BP has also agreed to take more steps to boost safety of drilling operations in the Gulf of Mexico, including third-party auditing and verification, training and well control equipment and processes such as blowout preventers and cementing. Under U.S. law, companies convicted of certain criminal acts can be debarred from contracting with the federal government. BP says it has not been told of any intent by government agencies to suspend or debar the company in connection with the plea agreement. Still pending is a separate civil court action in which the federal government contends BP was grossly negligent in causing the spill. “We’ve been in negotiations with BP. We have not reached a number that I consider satisfactory to resolve those claims that we have,” Holder said. The criminal deal announced Thursday with the Justice Department is also separate from a March settlement in which BP agreed to pay $7.8 billion to more than 100,000 businesses and individuals who say they were harmed by the spill. Archival video: The people of the Gulf Coast have survived hurricanes, but 128 days after the BP oil spill disaster, they're struggling to see a way forward. NBC's Anne Thompson reports.